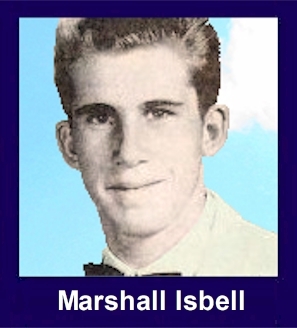 The 35th Infantry Regiment Association salutes our fallen brother, PFC Marshall Howard Isbell, who died in the service of his country on April 22nd, 1967 in Quang Ngai Province, Vietnam. The cause of death was listed as Small Arms/AW. At the time of his death Marshall was 20 years of age. He was from Eastanollee, Georgia. Marshall is honored on the Vietnam Veterans Memorial at Panel 18E, Line 69. The decorations earned by PFC Marshall Howard Isbell include: the Combat Infantryman Badge, the Bronze Star with V, the Purple Heart, the National Defense Service Medal, the Vietnam Service Medal, the Vietnam Campaign Medal and the Vietnam Cross of Gallantry with Palm Unit Citation. Marshall was an only child. He was a quiet boy, but had a quick wit and was well liked among his classmates in high school. We attended Stephens County High School in Eastanollee, GA. His girlfriend and he were to be married when he returned from Vietnam. Marshall was not a close friend, but in our small town you considered everyone a friend. He grew up on a small farm and was very active in the FFA in high school. I remember him at our Junior/Senior Prom in our senior year in high school. He was wearing his white coat with a carnation on his lapel to match his girlfriend's corsage. He had a "flattop" hairdo with long sideburns, and a warm, shy smile. We danced to the songs of the 60's, we laughed and kidded each other just like normal teenagers. After the prom we all went to a movie at the only theatre in town, then to a breakfast at the Lone Oak Motel which was owned by another classmates' family. After graduation night I didn't see Marshall until his funeral. I remember seeing him in the casket and thinking how handsome he looked. He would have been a wonderful husband and father. Goodbye Marshall - I miss you and think of you often. You'll always be a handsome, shy, eighteen year old boy in my mind.